Google recently added another way to reduce your PC's bandwidth demands when you're tethering, or any other situation where every megabyte counts. Chrome users can now add a new extension called Data Saver (Beta) from the Chrome Web Store that compresses web pages on Google servers before delivering them to your PC, a feature that mobile Chrome has offered since 2013. The new extension does not work when Chrome is in incognito mode or when you connect to a site using SSL (HTTPS) encryption. Why this matters: Reducing bandwidth demands is a common feature on mobile devices with browsers such as Silk and Opera, as well as the app Opera Max. Data compression on PCs, however, hasn't had nearly as much attention since PCs are typically connected to Wi-Fi or Ethernet and bandwidth constraints are less of an issue. Opera was really the only major browser to tackle data compression with its Turbo feature introduced in 2009. With laptops becoming lighter and more mobile by the month and Chrome OS growing in popularity, focusing on data compression for web-centric PCs is long overdue. 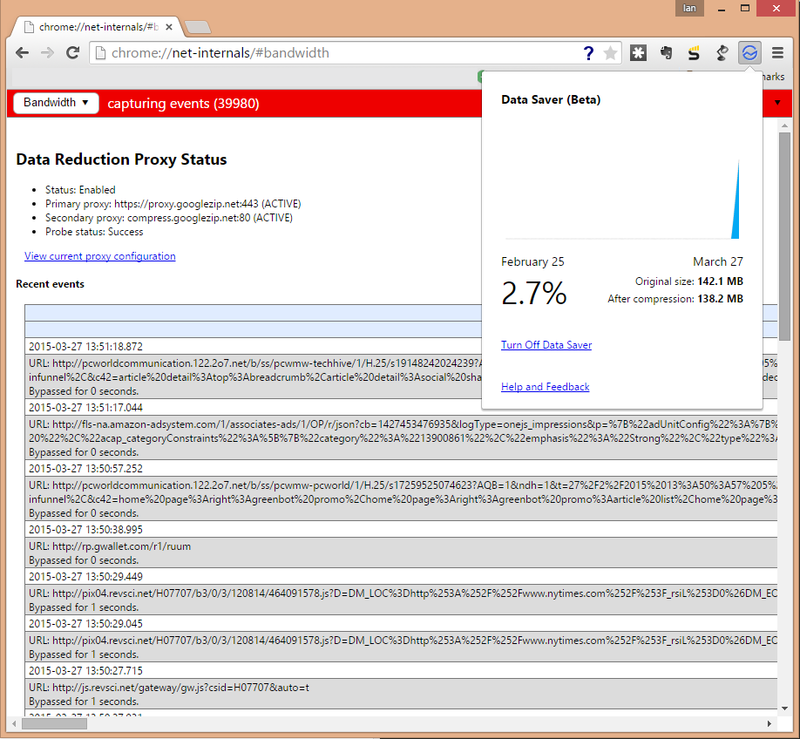 Data Saver (Beta) for Chrome on Windows 8.1. Using Data Saver is really easy. You just install it from the Chrome Web Store and the extension gets to work immediately. Data Saver places an icon in your browser to the right of the address bar. Click on it and you can see how much data you've saved, or turn Data Saver off. For anyone who wants a detailed look at their data compression activity, Chrome evangelist François Beaufort provided this tip. 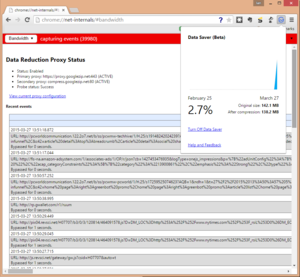 Paste chrome:net-internals#bandwidth into your address bar and hit Enter. This will open a tab showing all your latest bandwidth activity as well as a table at the bottom with a live update of your total bandwidth usage with Data Saver enabled. Data Saver is still in beta. As such, it may be prone to the occasional mishap and may not compress data as much as you'd like. Trying out the extension on my home set-up, for example, it seemed like a lot less data was compressed when I had Chrome on my 24-inch 1080p monitor versus my laptop's 12-inch 1366-by-768 display. Unless you're seriously in danger of going over your bandwidth cap at home, the best use case for Data Saver is when you're on the road using mobile broadband. You can also combine Data Saver with other data-saving features such as Windows 8.1's metered connection setting.